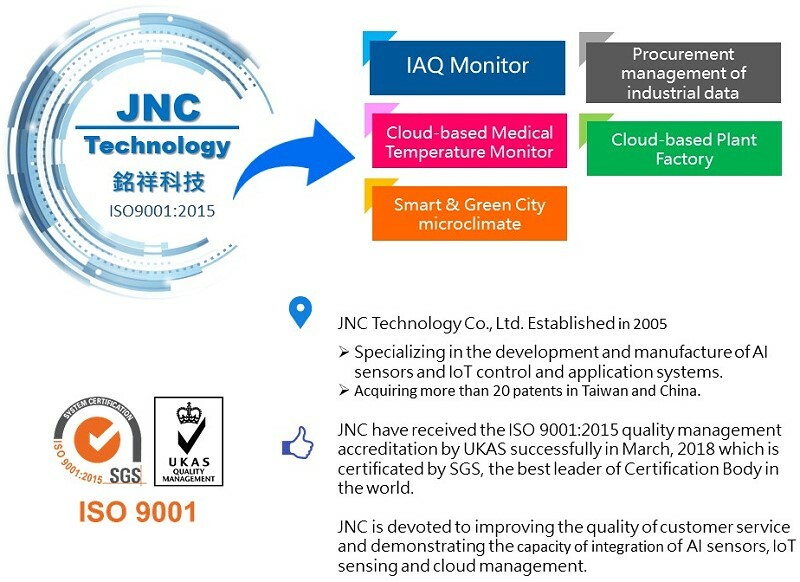 Established in 2005, JNC Technology specializes in developing and manufacturing industrial smart meters including cloud-based SMS alert devices, Indoor Air Quality (IAQ) monitoring equipment, medical temperature monitoring systems, and weather monitoring systems. We are one of the few Taiwanese companies who have acquired more than 20 patents in Taiwan and China. Our diverse list of customers includes every field such as government, biotechnology, environment protection, food, and electricity. To realize our brand vision “Joy & Creativity”, we continually provide best solutions that excel customers’ performances and efficiency by integrating new technologies such as Cloud Computing, Internet of Things (IoT), Big Data, and Industry 4.0.